SAMVIT is published by Sri Sarada Math's New Delhi Center. Samvit was first published in 1980, through the initiative of Revered Pravrajika Muktiprana, the first General Secretary of Sri Sarada Math and Ramakrishna Sarada Mission from 1959-1994. She chose the name Samvit, a Sanskrit word, which refers to the entire range of knowledge, from information to consciousness, awareness and the highest knowledge leading to Self-realization. A line from the Svetasvatara Upanishad, "May He endow us with good thoughts" was chosen as the publication's motto. As its name implies, this small publication contains a broad range of spiritual reading. Poetry, biographies, and scriptural studies, are found together with scholarly and reflective articles about a variety of spiritual topics. Some emphasis is given to themes related to women's spirituality. 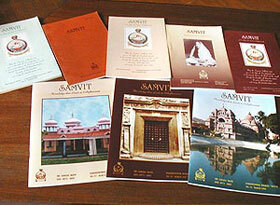 To subscribe or renew an existing subscription to Samvit Journal simply send your name and address with the payments. Payment should be made by money order, postal order or bank draft. Foreign subscribers may remit by International Money Order or Bank Draft, crossed 'A/c Payee'. We encourage all our readers to lend a helping hand in this noble endeavour by encouraging family, friends , libraries, schools, universities and other institutions to subscribe to Samvit. To gift a 5-year subscription, please send the name and address of the receiver and Rs.200 by M.O. or draft made in favour of'Sri Sarada Math'. The names of sponsors making 5 or more gifts will be mentioned in Samvit. Samvit subscriptions may now be made/ renewed by E- Bank Transfer from your Bank A/c. Kindly intimate your details by email (name, address, mobile no) at samvit80@gmail.com once the money is transferred, mentioning clearly that the amount is meant for Samvit subscription.